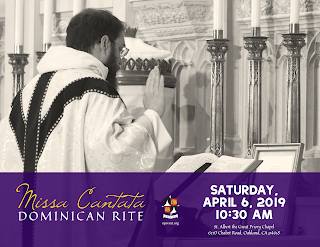 This is a reminder that that a Dominican Rite Missa Cantata for the First Saturday observance of this month will be celebrated on April 6 at St. Albert the Great Priory, in Oakland, California. The Mass will begin at 10:30 a.m.; the celebrant and preacher will be Fr Christopher Wetzel, O.P., parochial vicar of St Dominic’s Church in San Francisco. The music and servers will be provided by the student friars of the Western Dominican Province. The St Albert the Great Priory Chapel is located at 6170 Chabot Road in Oakland, with ample parking available on the street or the basketball-court parking lot. The next Dominican Rite Mass will occur on May 4, at the usual place and time.